Hi, everyone, and happy Monday! Welcome! If you’re new to here – I’m Laura Emerich and I started this blog 5 months ago to celebrate my mom’s legacy. 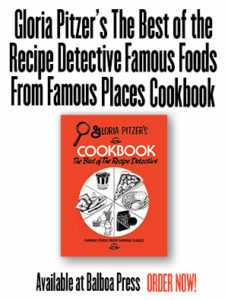 My mom is Gloria Pitzer; known to millions as the ORIGINAL “Secret Recipe Detective”. Mom passed away just over a year ago, leaving behind an extensive treasure that included her love of life, family and faith; as well as her creative writing, illustrations and “Secret Recipes” careers. 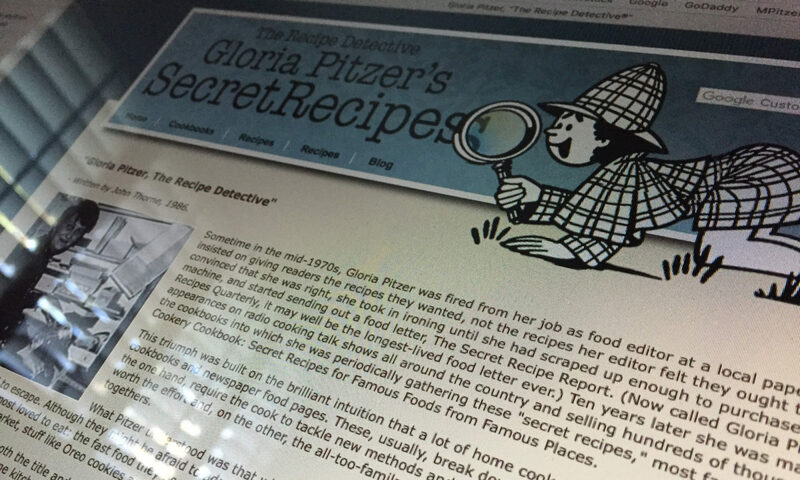 This week, I am finishing up my 4-part, special series, “Mom’s Story – How Secret Recipes Began”, sharing with you some of Mom’s own memories of sleuthing challenges that earned her the title of the “Recipe Detective”, which she later trademarked. This series is based on excerpts from Mom’s story, as seen on pages 292-297 in her last cookbook, Gloria Pitzer’s Cookbook – The Best of the Recipe Detective, published by Balboa Press (January 2018, 1st Printing) – which is a re-write by me, Laura Emerich, of her famous, self-published book, “Gloria Pitzer’s Better Cookery Cookbook” (May 1983, 3rd Printing). PAUL GAVE HIS BOSS TWO WEEKS’ NOTICE and left his job of 20 years to devote full time to helping me with the recipes and the newsletter. The subscriptions had increased from less than 100 to over 3000 in a few months. Bob Allison’s “Ask Your Neighbor” show was still one of our favorite contacts and before we knew it, we became a sponsor of Bob’s show. 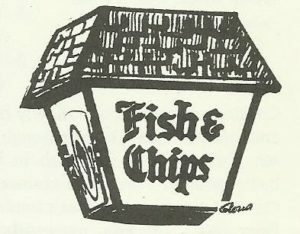 It was just prior to buying advertising time on Bob’s show that one of his audience had called in a request for a fish batter like Arthur Treacher’s. The caller specifically asked on the air if Gloria, “The Recipe Detective”, might give the recipe a try. I did and went back to the phone with each of several developing steps, waiting for the response of Bob’s audience to each one. The 1st several recipes were not quite “on target”. I wanted the recipe to be exactly like the famous batter of the fish and chips chain. 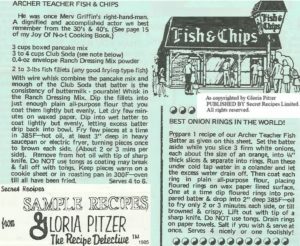 Speaking of the Arthur Treacher challenge (above) – the following is another commentary Mom wrote specifically about developing the recipe to mimic Treacher’s fish batter, as seen in her book, “My Cup Runneth Over – And I Can’t Find My Mop” [written and self-published by Gloria Pitzer, Dec. 1989; pages 73-74]. It was not a quick development, and others have tried to lay claim to this secret; but, in truth, Mom was the one to originally discover the “secret” ingredients AND process involved in developing a matching product at home. Unlike most of the companies, whose products Mom imitated, Treacher’s people accepted the copycat imitation as the homage it was meant to be. “Imitation is the sincerest [form] of flattery” – One of Charles Caleb Colton’s most famous aphorisms (1824). Lacon, Or, Many Things in a Few Words: Addressed to Those who Think (8 ed.). New York: S. Marks. #217, p. 114. The most exciting attention we received was the recognition given us by the Arthur Treacher people. At the time, the Arthur Treacher fish batter was unique. It was crispy and golden brown and very light. Everyone we talked to about fish wanted to know how to recreate the Treacher fish batter at home. The original challenge came directly from Bob Allison’s “Neighbors”. The TV commercials advertised that it was “the meal you cannot make at home!” I tried to disprove that. Finding the nearest Arthur Treacher restaurant [from “beautiful, downtown Pearl Beach”] was the real challenge. With a friend, I drove into Mt. Clemens and located one. After dozens of tests and trying what I thought would be a good Oriental Tempura batter, again, I was disappointed. I tried every fish batter I could find, in every possible recipe source [at the time], over a 6- or 7-month period. Finally, one day, by accident, I was preparing fish for our dinner – without any thought being given to Arthur Treacher’s batter – and on a lark, [I] mixed together boxed pancake mix and some Club Soda. Only because the plumber was working on the pipes and had turned off the water temporarily, did I resort to that Club Soda, so that I wouldn’t have to put off preparing dinner until the plumber was finished. Everybody had someplace to go that evening, so dinner had to be fast and on time. Wouldn’t you know it! There, on the platter, was a mountain of the most beautiful, golden, crispy fish that you would have sworn came right from Arthur Treacher’s own kitchen! 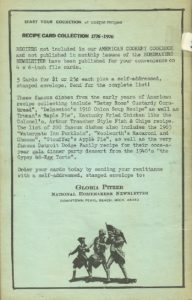 The next day, I retested the recipe and tried to work out some of the little flaws that we came across, before I could report back to Bob Allison and his “Neighbors” over, then, WWJ-Radio, Detroit. The biggest problem was how the coating kept falling off the fish during frying. It turned out, I had to correct two things – coating [the] moistened fillets, first, in plain flour, before dipping [them] into the batter and, then, having the oil precisely at 385F. Oh! And a third point: Never to use tongs – or the coating would break apart. Once the fish recipe proved to be free of faults, I sent a copy of the recipe to Carol Haddix, the Food Editor of the “Detroit Free Press” [at that time], for her comments. I had talked with her, by phone, during the many weeks that I worked on perfecting the batter, trying to discover why the batter would sometimes fall off the fish; why the fish was, sometimes, greasy; and a number of other problems. She offered me the benefit of her experiences with frying fish and told me to get her a copy of the recipe, if I ever perfected it. When she published the recipe in the paper, it carried her approval as “on target”. So, it does, therefore, have ample validation that the recipe is ours and does belong to “Secret Recipes”, in spite of the number of people I have had to confront on the issue over the years, regarding the plagiarism of it from our publications. 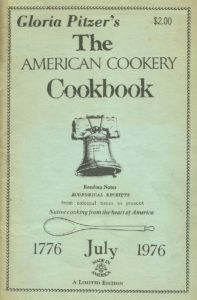 Because our recipes and newsletters are all “dated publications” and are subject to Interstate Commerce, we don’t use the same copyright procedures that book publishers use. More information about Arthur Treacher and a slightly different version of this recipe, using individual spices instead of the packaged ranch dressing mix, along with some other famous fish & chips-style dishes and stories, can be found on pages 105-115 of Mom’s last book, “Gloria Pitzer’s Cookbook – The Best of the Recipe Detective” [published by Balboa Press (January 2018, 1st Printing) – a re-write by me, Laura Emerich, of her famous, self-published book, “Gloria Pitzer’s Better Cookery Cookbook” (May 1983, 3rd Printing)]. Go to https://www.balboapress.com/Bookstore/BookDetail.aspx?BookId=SKU-001062252 to purchase the book for only $20.99! An eBook version is also available for only $3.99! 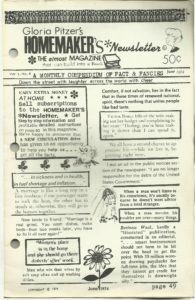 Please, come back and check out my blog next week, “Famous Foods from Famous Places”, when I discuss more of Mom’s writing career and how she earned the title of “The Recipe Detective”, which she trademarked; plus, the cookbook that began it all!